One thing that the Star Wars and Transformer fandoms have are good podcasts to chose from. For GI Joe…well, not so much. UNTIL NOW! Greg from JoeCustoms.com, Chuck from InsidePulse.com, Justin from GeneralsJoes.com and Gary from YoJoe have teamed up for a WEEKLY Joe ONLY podcast. No magic laser swords, no morphing robots, no gladiators, no silly turtles, just GI Joe and only GI Joe (unfortunately, that includes Ninjas, so we hope you don’t mind…). Each week we summarize the news covering everything from the toys, the comics, the cartoon and the upcoming movie sequel. We also interview high profile members of the community, review the latest product and discuss topics of interest to Joe collectors in our own show produced segments. Its fast paced, its funny, its interactive and its informative. 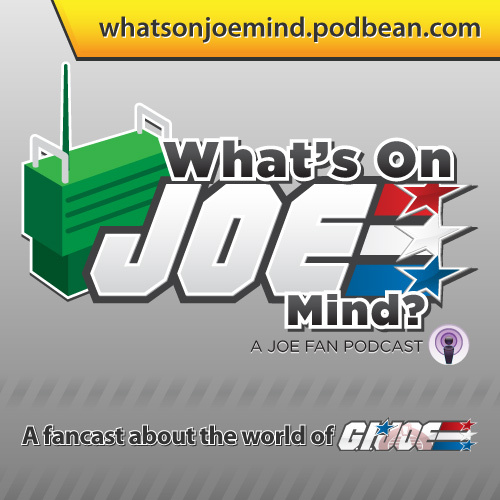 Think of Sports Talk Radio meets GI Joe and you got “What’s on JOE Mind?” We are a member of the Geek Cast Radio Network and are also hosted at Stitcher SmartRadio and InsidePulse.com. We advertise for these sites and other partner podcasts. If you have an issue with ads, you may want to skip. If you have time for another podcast in your schedule, check out WOJM and subscribe today!! Find their shows on Podbean, StitcherSmart Radio, InsidePulse.com and GeekCastRadio.com AND subscribe today!! This entry was posted in Fandom, Podcast and tagged dwayne johnson, entertainment tonight, gi joe, gi joe 2, gijcc, Hasbro, joe con, Joe Con 2006, Joe Con 2012, JoeCon, New Orleans, nola, Podcast, What's on Joe Mind by CmderinChief. Bookmark the permalink.